(Nanowerk News) Researchers of Karlsruhe Institute of Technology (KIT) are working on an efficient and inexpensive method for the production of organic plastics. In the “BioElectroPlast” project funded by the Federal Ministry of Research they use microorganisms that produce polyhydroxybutyric acid from flue gas, air, and renewable power. The optimized process of microbial electrosynthesis opens up further perspectives for the future production of biofuel or for the storage of power from regenerative sources in the form of chemical products, for instance. 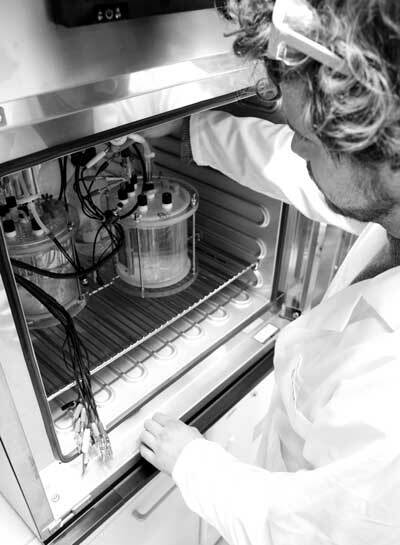 Biologist Johannes Eberhard Reiner, KIT, with the reactors for microbial electro-synthesis. The consumer’s wish for sustainable products also increases the demand for organic plastics, for e.g. disposable cups, packages or garbage bags. The “BioElectroPlast” project coordinated by the Applied Biology Group headed by Professor Johannes Gescher of KIT’s Institute for Applied Biosciences (IAB) focuses on a method to produce organic plastics with a minimum consumption of resources and at low costs. In addition, “BioElectroPlast” is aimed at using the greenhouse gas carbon dioxide (CO2) as an inexpensive and generally available raw material in the chain of values added and at applying renewable power. For this purpose, the scientists use a relatively new technology, called microbial electrosynthesis. About six years ago, researchers in the USA for the first time described how certain microorganisms grow on a cathode, bind CO2, and use the cathode as the only energy and electron source. A chemical process, by contrast, requires high pressures and temperatures and, hence, a high energy input as well as expensive catalysts. So far, microbial electrosynthesis has been used mainly to produce acetates – salts of acetic acid. As biocatalyst, the researchers use a newly isolated microorganism that permanently regenerates itself. Flue gas is applied as CO2 source. As a result, the concentration of this greenhouse gas is reduced and other sources of organic carbon that are usually applied as biotechnological substrates, such as agricultural products, are no longer required. Competition with food and feed production is avoided. The electric power needed for the “Bio-ElectroPlast” process is based on regenerative sources. The Federal Ministry of Education and Research (BMBF) funds the “BioElectroPlast” project under its initiative “CO2Plus – Material Use of CO2 to Broaden the Raw Materials Base”. “BioElectroPlus” started in September this year and is scheduled for a duration of three years. Apart from the IAB, the KIT project partners are the Chair for Water Chemistry and Water Technology of Professor Harald Horn at the Engler-Bunte Institute (EBI) and the “Microbial Bioinformatics” Group headed by Dr. Andreas Dötsch at the Institute of Functional Interfaces (IFG). The other partners are the University of Freiburg and EnBW AG. EnBW participates in the project to further reduce CO2 emission of coal combustion as a bridge technology. The researchers plan to test their reactors directly in the coal-fired power plant of EnBW in Karlsruhe and to use the exhaust gases produced there. In parallel to the “BioElectroPlast” project, KIT’s researchers also study the conversion of carbon dioxide into valuable compounds under the industry-funded ZeroCarb FP innovation alliance. Here, the scientists use alternative biocatalysts isolated by them, as the industry partners Südzucker AG and B.R.A.I.N. AG have specified different process requirements and concentrate on other end products.